In 1984, Donald I. 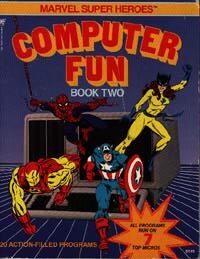 Fine, Inc. produced two books called Marvel Super Heroes Computer Fun. The books were written by Richard Guaraldo and Susan M. Zakar. 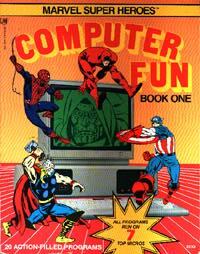 There were text-based programs written in BASIC that children could type in that were based on scenarios of Marvel characters. 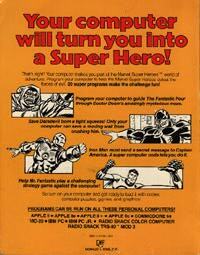 Daredevil was featured in about 3 programs. Daredevil is trapped! The only way he can escape is by stopping the wall at the exact meter reading the computer program is looking for. The meter on the screen would help - but Daredevil can't see - so he can't use it. You must watch the meter and get him out of this tight spot! Wait a minute, Daredevil's extraordinary hearing is picking up a message from Stilt-Man. Is Daredevil's old enemy up to his usual tricks? Daredevil can hear him - but he seems to be talking in code. It's up to you to decode the message. The program on the next page will help. 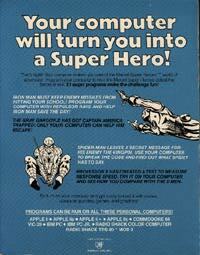 After you have decoded the message, help Daredevil write Stilt-Man a message in the same code. Hey, even Superheroes have to have a little fun, right? Daredevil's sense of touch is so developed that he can detect things that ordinary people can't see. He rubs his fingers over a ransom note received by the police. He can tell that some of the words were written at a different time. Too bad you don't have DD's powers. You'll have to do this a slower way. Input the program on the next page. Start removing letters, keep eliminating until you have a 6-letter word that makes sense. Good luck! Here are scans of the two books that were produced.